The vision of Church Renewal is to be a catalyst for church renewal in Canada and beyond. This is a lofty vision, but one for which God has given clear and simple direction and strategies. Through Church Renewal, Pastor Ray and Fran Duerksen of Southland Church in Steinbach, MB are working with pastors across Canada to bring renewal to the Canadian Church. As a result, they are seeing lives and churches transformed! They believe that if the Church is going to be effective, it needs to be centred in prayer. Prayer is the catalyst for transformation, renewal, and the expansion of God’s Kingdom and God has called His Church to this purpose. Church Renewal Weekend is where you as a leader can participate, observe, and experience firsthand the principles of Church Renewal applied within the context of a church congregation. You will see how these principles can grow your church in prayer. In the history of the Church, prayer has been the catalyst for the renewal. 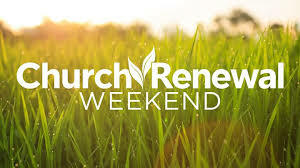 Church Renewal Weekends begin on Friday afternoon and end Monday at lunch. If you are a church leader, we would love to have you attend the next Church Renewal Weekend! There is a limited subsidy available for lead or associate pastors. Please contact Erin Knott at the District Office for more information. Sign up to stay in touch with news, stories, and events from the Pacific District.